The two first Dream Tricks Challenge articles challenged jugglers to attempt tricks that had never been done, at least on video. The results were quite amazing. 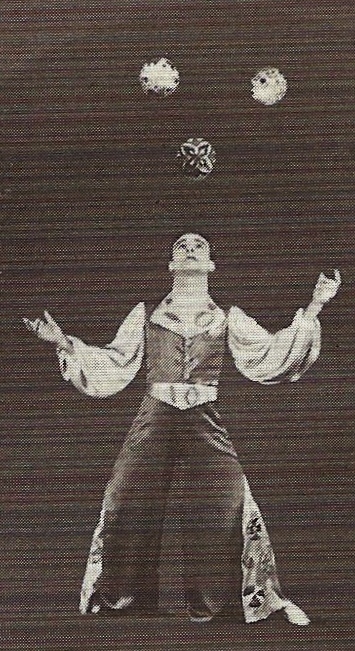 The third DTC article provided readers with 12 old school or Gentleman juggler tricks or routines to attempt. 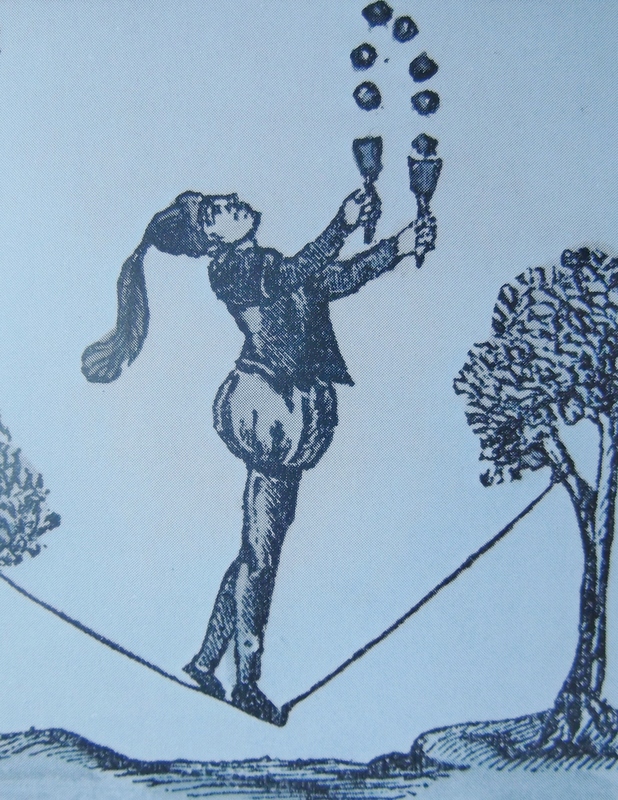 The fourth edition of DTC included 12 more tricks that come from the era of Gentleman jugglers and those of the same general era or shortly afterward. Below were the tricks and the resulting videos. 1. 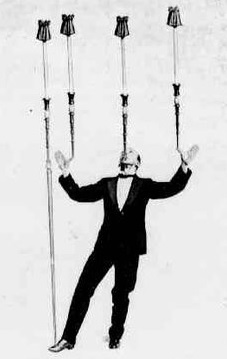 Rupert Ingalese’s Four Pole Balance – The photo below shows British gentleman juggler Rupert Ingalese (Paul Wingrave) doing a four pole balance. The illustration below it shows him doing a five pole balance seated. 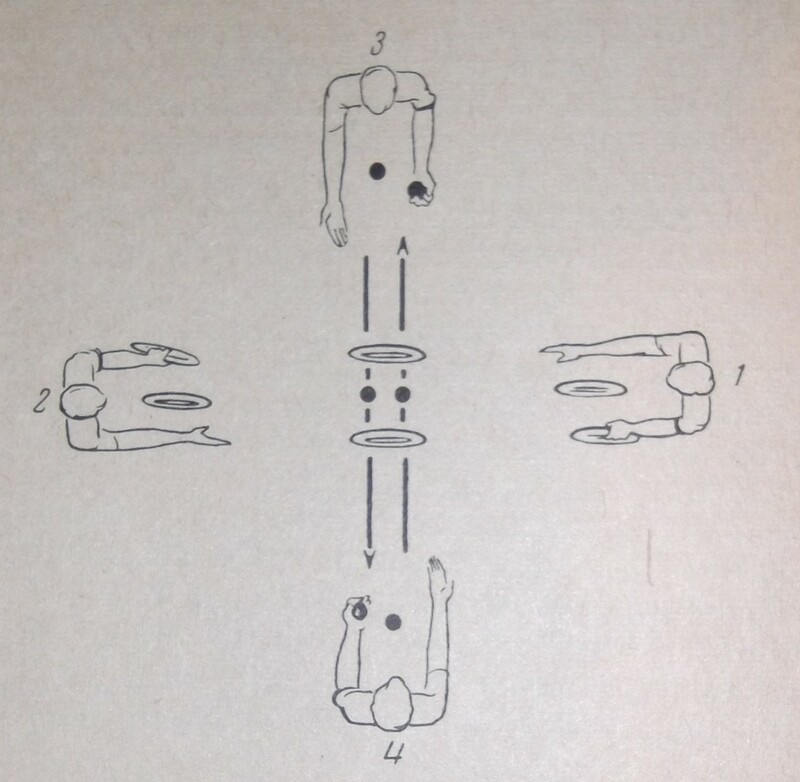 I was looking for the four pole balance, but said that some might find it easier to do seated. This trick was briefly accomplished by Ameron Rosvall, who gave it a try despite being out of top shape due to a serious illness. Great job, Ameron. 2. 5 Balls With Cup Sticks – I thought that this one would be reasonable, although I stated that starting the juggle may require the assistance of another juggler to begin the pattern. I suggested that small plungers could be used or you could make similar props. To learn more about cup sticks, click here. I was looking for a qualify of 5 balls. Since it looked like no one else was going to try this, I decided to worked on this challenge myself. It was much, much more difficult than I imagined. I made cup sticks from a diabolo and a plunger handle. I got the following clean run with four balls. Brian Koenig ended up meeting the criteria of the challenge, though, by just barely qualifying 5 balls with the cup sticks. 3. 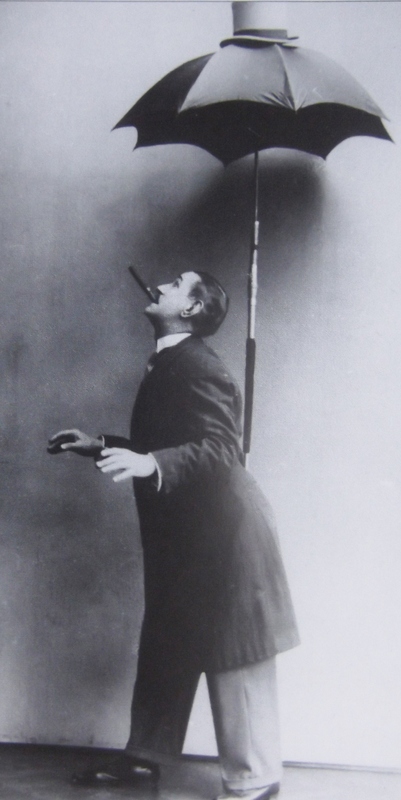 Salerno’s Lower Back Pole Balance And Hat Catch – One of Salerno’s tricks, shown below, was to balance an umbrella that was inserted into a cane handle on his lower back and then toss his hat up to land on the tip of the umbrella. For this challenge, simply balancing a pole or stick on the lower back / upper rear end and tossing a hat to it will suffice. One tip that might help is that the bottom of the pole will probably stay in place best if it is resting just above a belt. Also, the umbrella handle might need to be made longer than normal. This is the one trick that no one submitted a video for. 4. 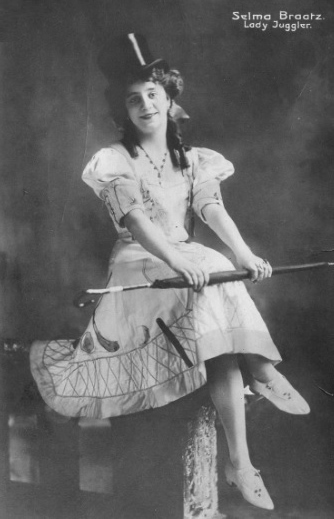 Selma Braatz’s 4 Ball and Cue Stick Trick – Selma Braatz balanced a billiard ball on a cue stick which she balanced on her forehead while juggling three balls. She would then drop the billiard ball off the cue stick and go into a four ball juggle while still maintaining the balance. The stick could be balanced on the chin, nose, or forehead and any type of ball could be used. Scott Sorensen not only achieved this trick, but also went one step further by doing the five ball version as well. You can see video of both versions below. 5. Freddy Zay’s 6 Rings On A Unicycle With A Forehead Balance – For this challenge, I was looking for someone who can balance a pole on their forehead and at least flash 6 rings while riding a unicycle. The unicycle didn’t have to be tall. This trick was accomplished by Marco Bonisimo of the Netherlands. You can see it below. 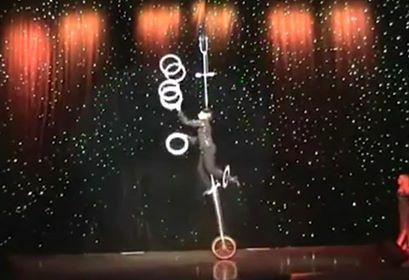 In the following video, you can see Erik Ivarsson perform a five ring version of it, balancing a unicycle on his head, and with a ring on the leg, like Freddy Zay. 6. Salerno’s Cue Stick Juggle And Balance Trick – Salerno juggled three billiard cue sticks while balancing one on his foot. While continuing the juggle, he kicked the foot cue stick up to a chin balance and then dropped it back to a foot balance. While jugglers were welcome to use cue sticks, I stated that the use of clubs was just fine for this challenge. Ameron Rosvall was able to do the second half of the trick despite being out of top juggling shape due to a serious illness. 7. Salerno’s Dumpling, Knife, And Fork Trick – Another Salerno trick was to juggle a dumpling, a knife, and a fork. While the dumpling was at the peak of the toss, he tossed the fork up so it stuck into the dumpling. When the dumpling (with the fork in it) finished falling, it was impaled on the tip of the knife. I recommended switching the dumpling out for an apple or some other fruit. Here is my version of this trick. I was unable to achieve it as I had described it, but I got somewhat close. I threw the apple into the knife point just after releasing the knife. I then caught the impaled apple on the fork. 8. 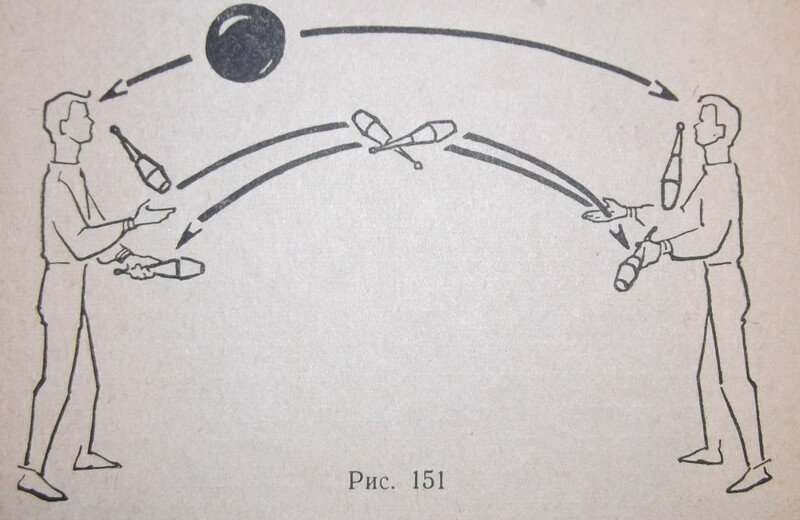 The Four Person Saturn Trick – As the illustration below shows fairly clearly, two jugglers pass 6 rings while two other jugglers pass 6 balls with the passed balls going through both passed rings. The trick was accomplished once by Brian Koenig, Ted Sartini, Scott Cain, and David Cain. 9. 6 Club Passing With Head Bounce – For this trick, 6 clubs are passed in a 2 count or 4 count and bounce a ball is bounced between the jugglers’ heads. Brian Koenig and myself (David Cain) were able to make some progress on this trick. Sakari Mannisto and a partner posted the following video to instagram showing their mastery of this trick using a staggered passing pattern. 10. 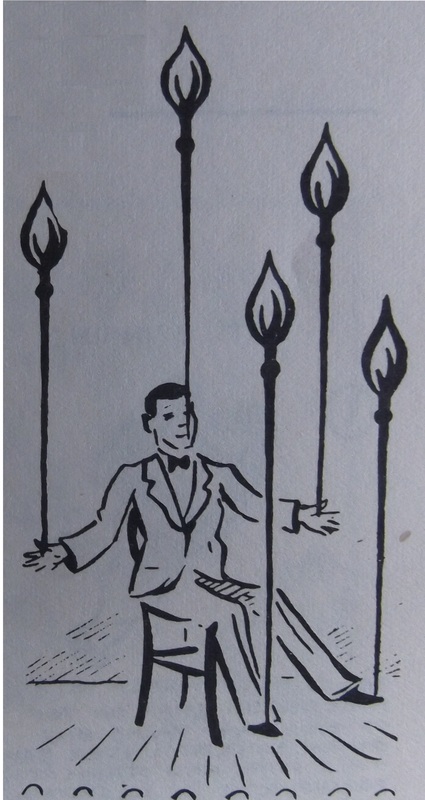 Balanced Candle Stick Catch – For this trick, a candlestick is placed on a pole and is balanced on the juggler’s forehead, nose, or chin and a candle is tossed up to land correctly in the candlestick. This trick was accomplished by me (David Cain). 11. 3 Knives And 3 Balls – This one was fairly straight forward. 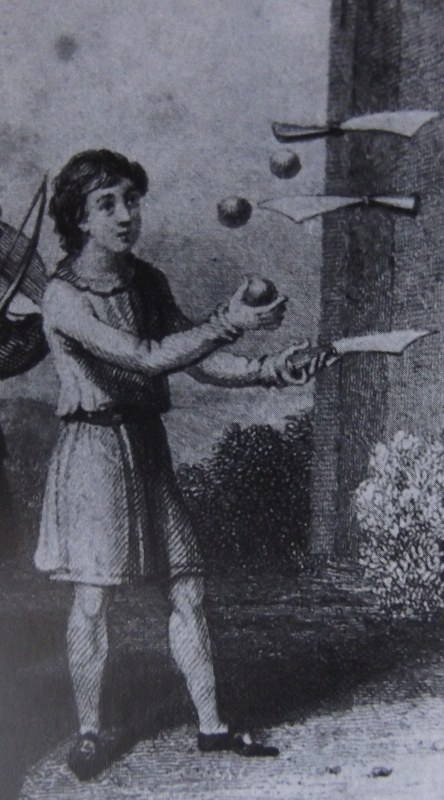 Qualify a juggle of the trick pictured below; three knives in one hand and three balls in the other. This was done by Luke Burrage. 12. 3 Ball Head Bounce – This is probably the toughest trick in the article, as there are only a few people in the world who can do a two ball head bounce. However, the Dream Tricks Challenges are about pushing the limits of what can be done. 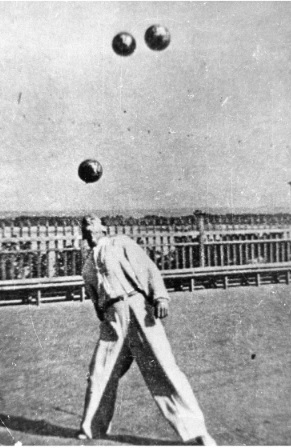 We do know of at least four old school jugglers who could bounce three balls on their head – Paolo Piletto, Konstantin Nikolskij, Massamiliano Truzzi, and Igor Rudenko. It is also rumored that Rastelli did the trick as well. The goal here is 6 bounces of the three balls, using only your head. 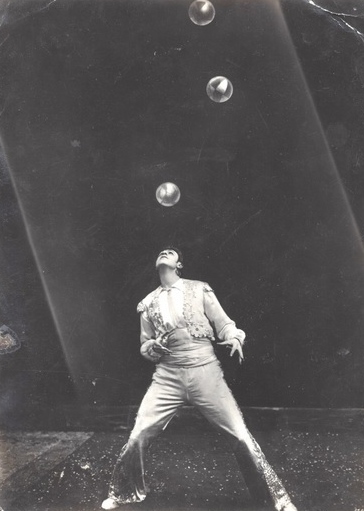 Below are three photos showing some of the above jugglers doing the trick. Scott Sorensen took on this incredible challenge and almost qualified it. He achieved 4 bounces several times and five bounces once, as you can see in the following video. I hope Scott keeps practicing this world class trick.